Anthony Hopkins has written and directed a very peculiar film. He is the first to say so. It has no continuity. That's what he explained to the continuity girl. It doesn't make logical sense. That's what he told the cast. It's stream of consciousness. That's what Spielberg told him. It's exactly the film he wanted to make. That's what he told himself. It's the film he had to make. That's what his wife Stella told him. "You're next." That's what Kevin McCarthy said in "Invasion of the Body Snatchers," and he says it again, in Anthony Hopkins' very peculiar film. Its title is "Slipstream." It played at the Chicago International Film Festival, and opens in theaters Friday. He thinks it's a thumbnail sketch of his own inner life. "I don't play a big part," he said. "It's not the central showy part. Felix is an observer and a witness of life, which is very much my perception of the world ever since I was a little child. I was a bit slower as a child and I sat in the back of the class, bemused, with a funny expression on my face, because I couldn't quite fit in anywhere. "And then I drifted into theater, I became an actor by default, I worked various theaters, and I didn't fit in. I just couldn't hack it. I couldn't get traction on what anyone else was doing. I played Shakespeare and I played Chekhov and so on and so forth. I couldn't get a grip on it; I didn't feel comfortable. I think this movie is me trying to express my feeling of alienation, with no anger or resentment, but a light jab at the acting profession, a kind of tongue-and-cheek poke, saying come on, lighten up, it's only a movie, it's only acting. "But it's not even meant to be a comment on that, because I broke all the rules, I had no concerns, because I'm not a poet or a writer. I can write a letter or write a postcard, but I'm not going to try and prove that I'm a great writer. I'm far from it. I have nothing profound to say. I was just interested in the peculiar randomness of our lives, and my role in the film is exactly what I am, wandering around in a state of asking, "What the hell is going on here?" Hopkins is a man, you understand, who has been knighted for his services to the acting profession. He won an Oscar for best actor, was nominated three other times. Won two BAFTA best actor awards, British Oscars, nominated for two others. Created Hannibal Lecter, one of maybe a dozen movie characters everybody knows by name. "I was fascinated by the trick of memory, how memory and the dream world overlap. I think what I was trying to express in this film was that it is all an illusion, that we're just passing through. Goodness knows what's on the other side. The peculiar enigma of life and time. The impermanence. Every mini-second, you can't grab it. Every moment we spend is gone. There was a 19th century British painter who only painted the backs of people walking away. And I wanted to get the idea of all the actors, walking away. I grabbed as many shots as I could, of actors walking away from the camera as if, well, we're all going to walk away one day." We were sitting in my living room, with our wives. 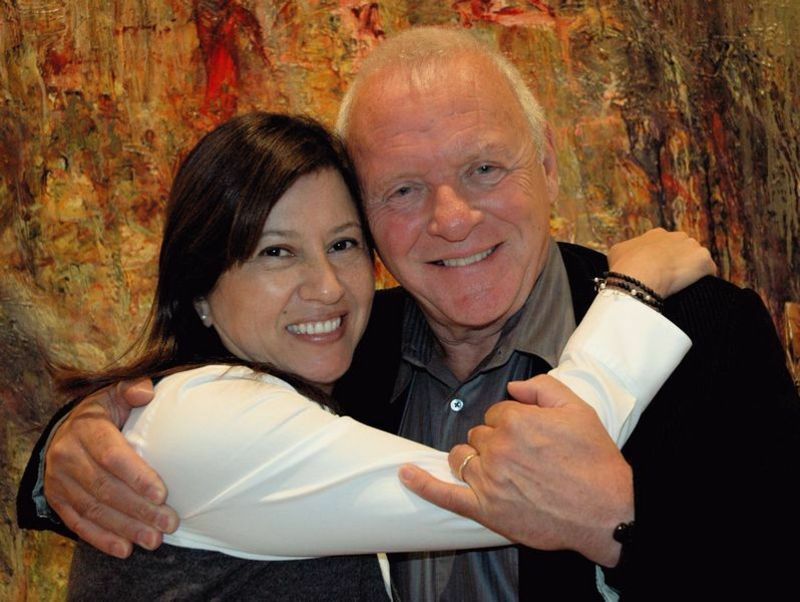 Stella Arroyave, who Sir Anthony married five years ago, was an antiques dealer who on this picture was a muse (telling him he should write the screenplay), a producer and an actress, a very good one. Bigger role than her husband. Hopkins and I once shared a moment neither one of us will ever forget. One night in a Formica restaurant on North Avenue, the waitress said, "'Aren't you Hannibal Lecter?' 'Why, yes,' Hopkins said. 'I wish my husband was more like you,'" she said. "Slipstream" centers on a troubled movie being shot in the Mojave Desert. Felix Bonhoeffer, the character Hopkins plays, is the film's writer, who is confusing reality with illusion. His characters appear in his life, his life appears in the movie, and mostly he looks on uncertainly while both real and imaginary people do all the loving, living and dying. Bonhoeffer, not the most common name, also belonged to Frederick Bonhoeffer, a German theologian who was involved in a plot to assassinate Hitler, and was executed. Not the same Bonhoeffer, Hopkins says, although his film is illuminated by flash-frames of historical figures who populated the lives of both Bonhoeffers: Stalin, Roosevelt, Churchill, Hitler. How can such a famous, respected and honored actor not "fit in," I asked him. "I never really did feel a part of the acting profession," he said, "which I'm very pleased about, because it keeps me detached. I don't mean cold or isolated, but it keeps me detached. When I came to America after leaving the National Theatre, I found myself in movies. I enjoyed the freedom of the movies. But in recent years I thought, well, I've done some passably good films and I've done some films not that good and I would like to resurrect my old rebellion or feeling of never belonging and express myself in an experimental way. "Well, I can. What are they going to do? Put me in jail? People are probably gonna sit there and go, 'What was that? Did I just see that? It's like a ghost passing by. Did you see that?' I've sometimes been in situations -- I had a concussion once and I've had one or two little things happen to me when I've been overstressed, overworked, tired, overdone, and I get a slight amnesia, which is pretty alarming. So I've learned to calm down and not be so manic. And that's why I wanted to experiment with people's sensibilities. I realize, of course, that it's going to irritate a lot of people. "But I wanted to stick with the experiment. "The actors asked me, 'What's it about?' I said, it doesn't matter, really. Christian Slater got it. John Turturro, he said, 'Yeah, I'll do it. OK. What's it about?' I remember Bill Lucking, who played Inspector Larabee, said, 'What is it about? Beats the hell out of me.' And the continuity person said, 'I'm so thrilled to be on this. But there is no continuity.' I said, well, the theme of it is that there is no continuity. "Think of life. The mayhem, the carnage and the horror. And then finally the talk, talk, talk. Yalta, Churchill, Roosevelt, Stalin, talk, talk, talk, talk. Yakkity, yakkity, yada, yada, yada. In the meantime, millions of people are just gone to dust." Why did you chose such a difficult location? I asked. The Mojave, 120 degrees. "I've always been interested in the desert. When I first came to Los Angeles I drove into the desert a few times and I loved it. I used to drive up to Bakersfield, I used to get in the car on my own, this was many years ago, and then I saw "Blood Simple" (1985), and I thought that was a wonderful film; The Coen Brothers filmed 'Blood Simple' in the desert. And those peculiar science-fiction movies which always have a giant tarantula in the desert. There's that sense of wilderness and spiritual nada, like he's finding this spirit in the nakedness of the desert. Bonhoeffer, wandering through limbo in the desert." A very peculiar film. He'll tell you so himself.